Elvira resurrects the original zombie classic, and devours it with raw energy. Elvira loves George A Romero's masterpiece so much, she's takin it to the grave. Elvira sets off for the far off future, and 1985, in this high tech chase for the minds of killers. Evil Bong - Potheads Beware: You could enjoy this trip so much you'll DIE. 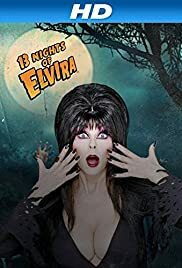 Join Elvira as she gets a Whif of this "High Art" and gets high with a little help from her fiend, Tommy Chong.